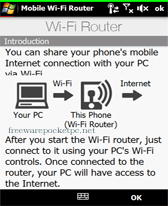 Scrub v1.00 freeware for Windows Mobile Phone. Summary: Scrub is a small Windows Mobile utility to detect missing information such as email addresses, home or work phone numbers, addresses and birthdays from your contacts. Scrub is a small Windows Mobile utility to detect missing information such as email addresses, home or work phone numbers, addresses and birthdays from your contacts. 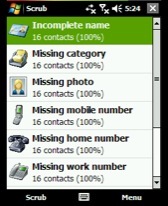 It can quickly scan all the contacts on your device, and group them by the type of information missing. * Firstly, it's useful as an organizational tool - especially if you like to filter contacts by Category or Company. * Secondly, it can improve your safety by checking whether you have sufficient communication options to reach your friends and family in case of an emergency. * Thirdly, it helps you ensure that you've captured the full names, numbers and email addresses of the people you meet when networking socially. * Finally, it's interesting to use when you're bored and have nothing better to do on your phone. Almost an awesome app. if it could compare entries to find duplicate numbers and names and then combine them it would be perfect. very fast and compact. HTC HD2. usefull. quick, small and fast to install, no problems on my HD2 so far. wow! working great on my htc touch pro. 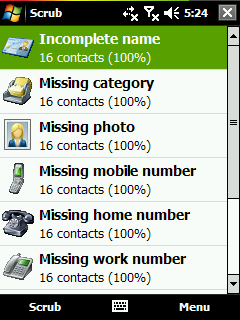 I would like to have the program email the persons with missing information with a configurable message. That would be perfect! Yet to try... but its an amazing concept. I love it! 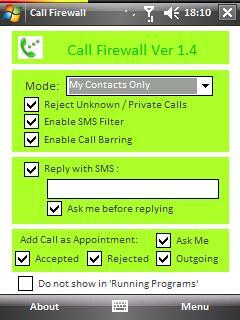 Great tool for my contacts. I would know the missing information that I need to fill in. Tnx! !